ICVerify user? I hope not. Because the product is officially end of life and end of support. If merchants have an issue, there will be no help to recover and process transactions. 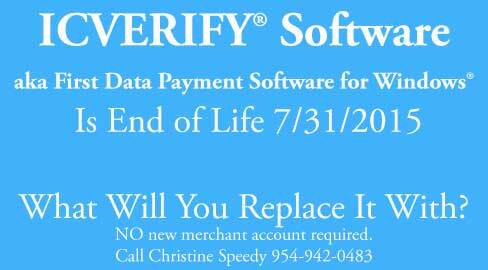 What are First Data Payment Software aka ICVERIFY alternatives? Any card present transactions? If yes, choose a payment solution with EMV certified terminals today. Beware solutions that will ‘get you EMV ready’. With the October 1 liability shift nearing, don’t rely on a last minute certification that may or may not happen. Any commercial business component, i.e. business to business (B2B)? If yes, only choose a payment solution that supports level 3 data for all sales channels, for your processor. That means a virtual terminal and or payment gateway is required because desktop terminals do not support level III. TIP: Most gateways also do not support level III for retail, so if that’s a need, the list of options gets small very fast. Any ecommerce or online payment transactions? If yes, consider requiring 3-D Secure. Historically, card not present fraud increases dramatically after a country adopts EMV. Criminals always find a way to go after the lowest hanging fruit, so even if there was none before, merchants are exposed. The EMV equivalent for CNP is 3D-Secure, which includes Verified by Visa or Vbyv. This case study by Visa Europe is a good overview of the benefits for merchants. Does card data need to be stored? How is authorization from customer to charge the card with token managed? How does that compare to current methods? Any customers on account? If yes, ask how the solution might help with collections management. How long is data stored for? In addition to daily business needs, audits are simplified and cheaper when electronic data is available via remote access. How flexible do you need to be? Do you want to be able to change processors without disrupting operations? Do you anticipate future software or other business changes? If you there’s any retail sales: CenPOS, a merchant centric, processor agnostic end to end payment engine, has US EMV certified terminals and is certified for level III retail. If 100% card not present: First Data gateway, 3Delta, and CenPOS all support level III. CenPOS provides the greatest value for accounts receivable. First Data gateway is proprietary and if you want to change acquirers at a later date, it’s unlikely you’ll be able to get your data to migrate. FDMS also requires multiple extra steps for submitting level III data and there’s multiple ways that the transaction can downgrade to non-qualified rates; Customers I’ve switched to CenPOS more than offset their fees while also increasing flexibility and security. Why choose CenPOS to replace ICVerify? It’s a robust payment processing platform that solves many business problems, including eliminating the ubiquitous paper credit card authorization form. Save time. I know your business. For sales and integrations, contact Christine Speedy 954-942-0483, authorized payment gateway reseller including for any B2B merchant solutions needs. This entry was posted in Equipment-POS, merchant account Q&A, Payment Gateway, virtual terminal and tagged first data, icverify by Christine Speedy. Bookmark the permalink.